Keith and Lynda met in Sydney on Anzac day 2005 at typical Aussie BBQ, playing Two Up with buttons. With Keith already planning his next “semi-retirement” on Hamilton Island and Lynda not long into a new job, there seemed little prospect of a relationship. ITIKI's Senior Vice President of Making Stuff Happen, Keith was born in South Wales, UK where he stayed until the ripe old age of 6 months. Allegedly he can cry in Welsh but definitely cant sing! As his father was in the RAF he moved around a lot, in fact he had changed countries 5 times by the age of 7, so this may explain his adventurous spirit, adaptability, discipline and drive. His family emigrated to Sydney, Australia as “ten pound POMS” when he was 13, settling in "the Shire". It was here that he learned to sail a Sabot on Gunnamatta Bay and it was absolutely love at first tack. He set about working weekends to raise the money to buy the plans and materials to build his first boat, an 11ft ‘Moth’. Sadly his family decided to move back to UK a few years later leaving Keith to start plotting his return to the country he considered home. Opportunity led him to Dartmouth as a junior Royal Naval officer and helicopter pilot. However square pegs and round holes don’t go together so he resigned after 3 years and headed home to Sydney. First priority was to find a boat to sail on. An Australian ‘Quickcat’ is sadly a misnomer but fortunately Hobie cats had just appeared on the scene and Nitra-D, his first Hobie 14, was launched. The Hobie soon took off with huge fleets worldwide being established. In 1973 the first Hobie 14' Worlds were planned for Hawaii and Keith set himself the challenge to make the Aussie team. He did, and did so again in the Hobie 16s' on 3 occasions. During this time Keith established himself in the sailing scene that had become his life and passion. He joined Miller and Whitworth working along side Olympic and World champions including the legendary Bob Miller (Ben Lexcen), who designed Australia II, the first boat to win the America’s Cup from the Americans. He established his own a ships chandlery and snow ski shop (another passion), worked with the Sydney Maritime Museum, built various boats and helmed a yacht in the infamous 1998 Sydney to Hobart. More recently Keith dreamt up a unique, high speed sailing business in the Whitsundays with a Nacra 36, worked on the 2017 America’s Cup challenge and went on to set up a highly successful charter business on Sydney Harbour (with a FP Lipari). 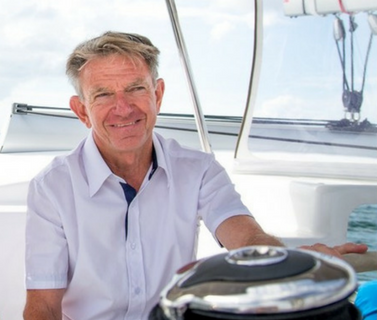 ​Keith is now officially retired and fully impressed in living the dream aboard ITIKI. Let the next stage begin! ITIKI's Chief Relaxation Officer Lynda, was born and bred in Hobart, Tasmania, in the sleepy suburb of Glenorchy to be precise. She enjoyed sport, shopping & science, excelling in the latter and going on to complete a BSc (microbiology) at UTAS. Life in the lab didn’t really cut it though so Lynda donned a backpack and headed off to Indonesia as many Aussies did back then. She spent 9 months travelling through SE & NE Asia, got side-tracked on the way home and spent another 9 months teaching English in Seoul, before finally returning to settle in Sydney. Despite many years watching the end of the Sydney-Hobart yacht race it wasn’t until she finally got to watch the start that Lynda decided to take up sailing. There was the mandatory competent crew course on Sydney Harbour, some (at times) hair raising twilight races and then hanging around the crew board at the yacht club hoping for a ride on a “race” boat. Lynda’s preference was to stick to the relatively predictable and warmer waters in and around Sydney Harbour, spending the day racing, getting back to the bar in time for a drink and a debrief, before heading out on the town. There was the occasional trip north though, for Hammo and Port Stephens and the infamous JOG regattas, but trips to Hobart were strictly on Qantas. 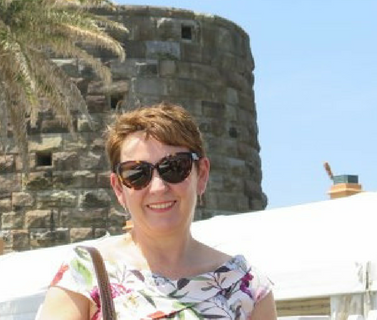 A Masters of Public Heath at Sydney Uni and a chance advertisement in the newspaper led Lynda to a rewarding career in research in the Pharma industry, one that took her to Switzerland for a 5+ year stint in a Swiss Biotech (fortuitously owned by one Ernesto Bertarelli). 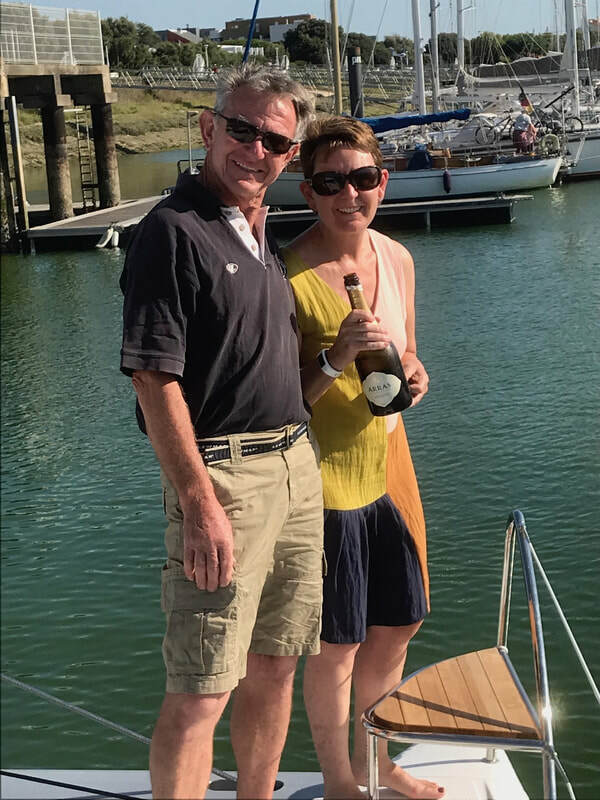 She survived in a landlocked country by sailing on the lake (on one of Ernesto's "old" yachts), cheering the Swiss AC team to victory, frequent trips to French wineries and learning to ski at the ripe old age of 35. On returning to Sydney it was sailing that led to her fateful meeting with Keith. Off the water Lynda’s career in clinical research continued to be a passion; working in a senior leadership role with a great team of highly skilled and motivated professions in a company that has helped bring dozens of new therapies to Australian patients and to world market. Opportunity knocked in late 2017 and the stars aligned, ITIKI was born and it is time to take a career break. A whole new world awaits, learning how to “cruise”, live aboard (in a confined space with Keith…), provision, navigate passage plan and, importantly, relax and have fun! 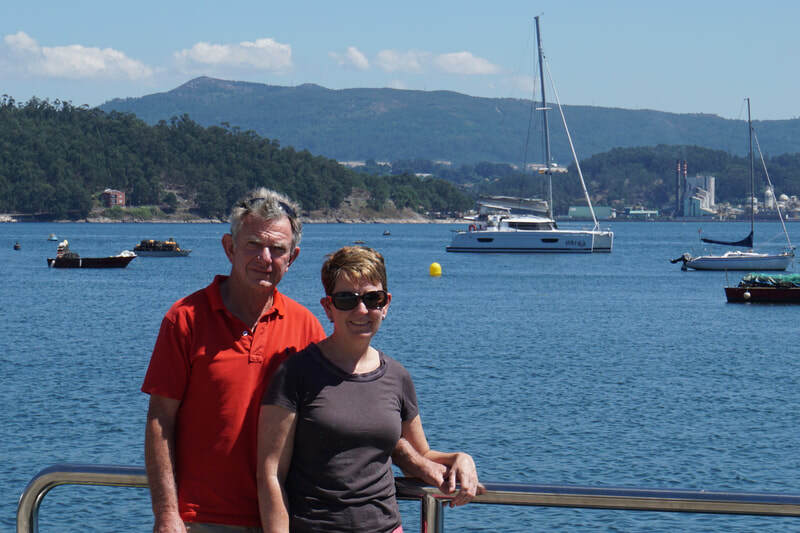 When Keith returned to Sydney we bought our first Fontaine Pajot, a Lipari 41 Evo, thanks to our friends at Multihull Solutions, and had it shipped over to Australia. We had plans for Keith to run it as a business until such time as Lynda could escape the rat race and sail off into the sunset. The South Pacific cruising was our original plan, although we would have loved to make it to the Med the thought of braving pirates or going the “wrong way” didn’t sit well. As it turned out Too Up Sailing was a great success, and so we put the business on the market and ordered a new Helia 44 Evo to pick up in France. ​for however long it takes to sail the boat back to Australia.